There were 77 countries under consideration, and 49 of them were in recession in 2009. Economists – as reflected in the averages published in a report called Consensus Forecasts – had not called a single one of these recessions by April 2008. In Rome the whole profession would be feeding the lions. Free work as a way for getting experience, contacts and final success? Think twice. Here is a heuristic for deciding what to do when you are asked to work without money involved. And some thoughts on the issue in the Financial Times. This chapter introduces us to the paradox of stability. Antifragility needs stressors in order to work, and randomness is inevitable, so if we force the system to be stable, we make it more fragile and, eventually, when some random event occurs, the effect is a lot more catastrophic than a normal accident would be. In this chapter, Taleb is particularly playful and sarcastic, so it’s difficult to draw the line on what Taleb really believes. Clearly, he doesn’t address magnicide as a real solution for better politics, but it’s not clear to what level he believes that any attempt to bring stability will backfire, or that modernity is just a creator of problems for humans. I particularly enjoyed his interpretation of divinations and other religious beliefs of the ancients as ways to introduce randomness in our daily lives. Of course it is partial, but it is both helpful to get a richer interpretation of how life was in ancient times as well as a practical recommendation to take better decisions in our daily activities. It is also remarkable his description of an analyzing losses bias, by which, when facing a loss, we are unable to see the benefits of such a loss; but that’s how a small forest fire prevents a big, catastrophic one, or small disturbs in a country can avoid a civil war years later. Taleb lists all the problems that such modernity has brought to our lives and considers that the main cause for such problems is denial of antifragility. Again,we shouldn’t read this as a narrative that tries to explain everything in history, but more like a cautionary tell to avoid our tendence to overvalue rationality and forget antifragility. 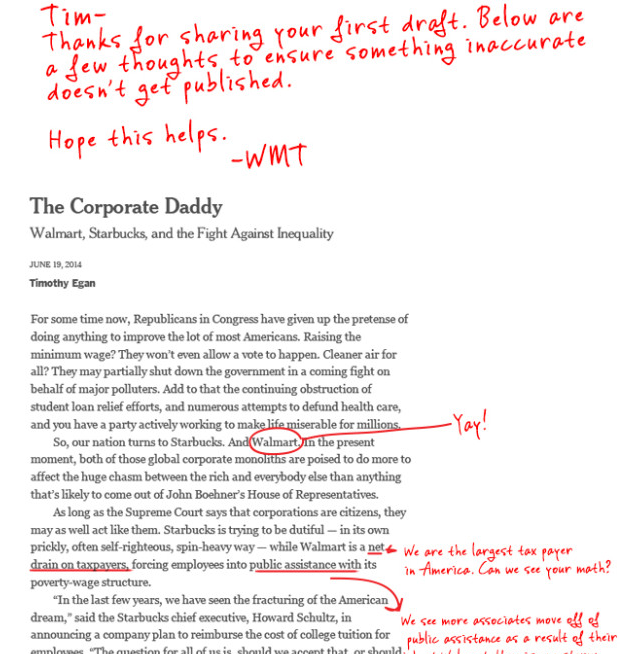 The New York Times published an opinion column a few days ago heavily criticizing Walmart. Here is Walmart’s response. I don’t want to enter the heart of the matter, I am simply fascinated by the format of Walmart response. Effective indeed. This is going probably to have a bigger and more imminent effect than driverless cars.